Having a confident smile can change everything. Invisalign makes the decision easy, because you can get a stunning smile without most people even noticing you're going through treatment. Invisalign is a brace system which consists of a series of completely clear, removable custom-made aligners, which fit over your teeth. Each aligner is individually manufactured with exact calculations to gradually move your teeth into place. With Invisalign there is no need for metal wires or brackets. New aligners are fitted on average, every two weeks and should only be removed for cleaning, eating, drinking and contact sports. 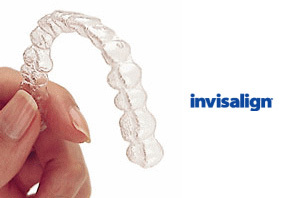 Invisalign braces are extremely discreet, so confidence is boosted both during and after treatment. With treatment lasting anywhere from 12 to 18 months, they are a very popular choice with our adult patients. Invisalign braces are only available as a private treatment option. By sitting over your teeth, the clear aligners are able to gently 'nudge' your teeth into the ideal position. Clear aligners are generally suitable for patients over the age of 16 with milder crowding conditions. More severe problems usually require one of the other types of brace to achieve a perfect result.